This weekend my son Matthew and I are speaking at the SCGS Jamboree. One of our sessions includes sharing lots of great ideas about incorporating technology into your family reunions this summer. When your family spends time learning about their family history together, it creates strong bonds in a way no other activity can. And guess what? Genealogy can be entertaining and interesting, especially when you get technology involved. Family YouTube Channel. Be sure you are creating new family history for the next generation to enjoy by preserving the audio and video of these family history presentations. Record the talent show, the family lip sync and the family history skits and share them with family members or upload them to your family YouTube channel. or your family YouTube channel. These videos are great to share online after the reunion or watch together at the next reunion. what the family can do to be healthier. Tell about the immigration of an ancestor, or a particularly hard challenge that a family member overcame. 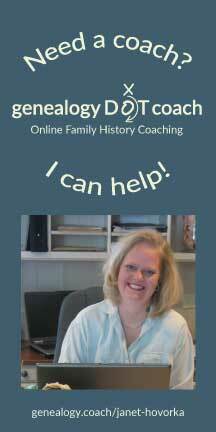 Or focus on the timeline of one ancestor and experiences they had in their lifetime. Deliver the presentation to your family with an LCD projector and make the presentation public and share it over your family’s social media so they can view it again later. If you are unfamiliar with some of these online resources, choose your favorites and delegate them to those who welcome technology. It's a great way to get the techies in your life involved with other family members and showing off their skills. These ideas along with many others are included in my newest book, "My Ancestor Family Reunion Version". Over 100 pages of meaningful family reunion ideas and activities will involve all ages both in the family reunion planning and at the event itself. 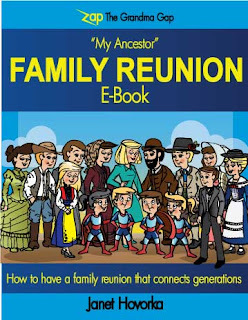 Choose from 8 versions of "My Ancestor Family Reunion" that teach more about British, German, Jewish, Swedish, Mormon, Danish, Civil War, and Pioneer heritage. Click here to purchase this e-book now for immediate download. You will instantly have ideas to implement at your upcoming family reunion. Happy planning!